Female terrorist Hasna Aitboulahcen apparently upset about police assumption. 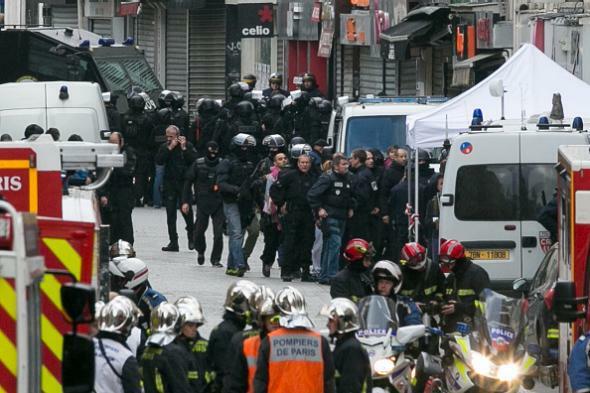 French law enforcement personnel near the site of Wednesday’s raid in Saint-Denis, just north of Paris. Update, Nov. 20, 2015: Per multiple reports, French authorities now believe that Aitboulahcen did not in fact blow herself up during Wednesday’s raid but was actually standing next to someone else who detonated explosives. Three police officials have told the Associated Press that a woman who died in the police raid was Abaaoud’s cousin. One said the woman, Hasna Aitboulahcen, is believed to have detonated a suicide vest Wednesday in the building after a brief conversation with police officers. The official confirmed an audio recording, punctuated by gunshots, in which an officer asks: “Where is your boyfriend?” and she responds angrily: “He’s not my boyfriend!” Then loud bangs are heard. Very frustrating! You do just as much work—probably more—than the men in your murderous, apocalyptic terror cell, and then the police who have arrived to take vengeance upon you for your brutal crimes just go and assume you’re there because you have a crush on Abdelhamid Abaaoud. Typical.